We have to admltt o being pleasantly surprised with the quality and fom factor of the Huawei Blaze. lt‘s alittle Iongerthan the HTC Explorer and is certainlythinnerwith a lovely rubberised coating at the back which aids comfort. Directly below the base of the screen you'll find a physical Home button and a series of touch-sensitive Android controls to the sides. Our only gripe with these was the Back button, which for some reason was positioned on the left. Most other handsets we have used have this button on the right, so in the beginning we ended up pressing the Search button. 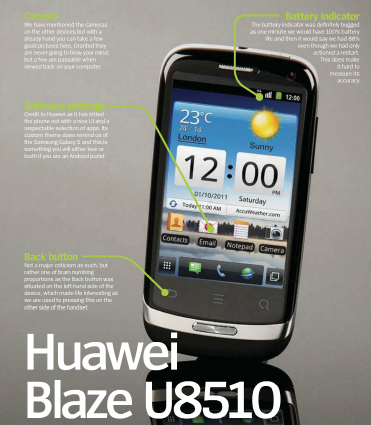 Similar to the other products the Blaze is equipped with Android 2.3 and Huawei has added its own custom Lil, which from a home screen perspective, is lovely. We certainly liked the smooth transitions. However, the main application icons are all modified from their default Android variants, which you will either love or hate, but the supplied software is certainly respectable with a lovely custom music player and handy backup software. We also liked the onscreen keyboard which was very accurate. Only the provided web browser lets the side down as it did n‘t scale the webpages automatically to fit the screen, and similarto the other products, the internal phone storage was a touch on the low side. When it went too low this seemed to affect the performance alot more than the HTC due to the 256MB RAM. Thankfully by grabbing a memory card you can solve this speed issue. Saying that, when it came to streaming content from video shanng sites we had no problems to report and in HQ mode the screen was certainly a lot brighter than we had expected. Mind you its camera quality was dependent on whether you could keep a steady hand as the slightest movement would result in out-of-focus shots. Battery life for video playback or Wi-Fi usage was not brilliant either. This was certainly not helped by its battery indicator which was misleading. The only saving grace was a great little feature which notified us when the battery life was about to die. It then gives you 30 seconds to close down your apps before shutting down-a nice touch!